Despite their similar appearance and shared moniker, broccoli and broccoli rabe are more like distant cousins than siblings. Our old friend broccoli takes on a more complex texture and flavor when roasted instead of steamed. Mediterranean and Asian flavors like sesame, soy sauce and feta take the humble florets to a more exotic place. 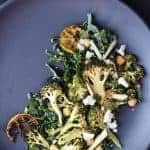 This salad works well with a simple roasted chicken but can also be a hearty vegetarian meal for two. 2. Cut broccoli into florets, leaving a bit of stem. Cut lemon in half lengthwise, then into thin slices. Spread all in 1 layer on a baking sheet, drizzle with olive oil and lightly season with salt and pepper. Roast until slightly charred, turning midway. Total cooking time will be about 15 minutes. 3. Combine all the dressing ingredients and whisk to blend. 5. 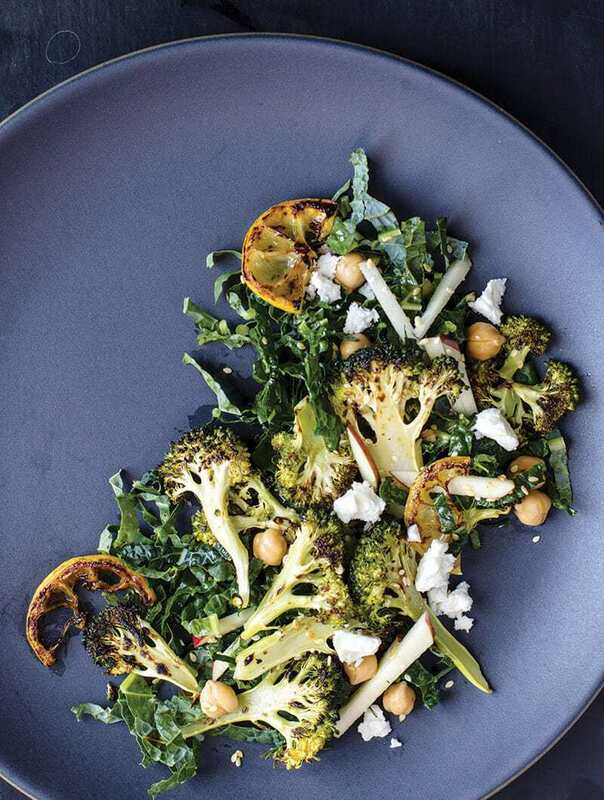 On a platter, mound the salad then top with the roasted broccoli and lemon. Drizzle with additional dressing and finish with feta.